No more soggy sushi! 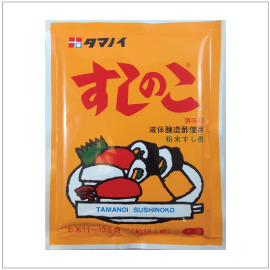 Get perfectly fluffy, moist sushi rice every time with this easy to use powdered sushi vinegar from Tamanoi. Just use approximately 1 tablespoon of Sushi Powder for every 1 cup of uncooked rice. To prepare for sushi rice: spread warm, cooked rice on a flat surface and sprinkle sushi powder evenly over the rice and mix thoroughly. Once cooled, it is ready to be used. It’s simple as that, convenient and delicious to boost!